The master cabin is one of the (many) reasons we purchased this boat. We were initially only looking at Valiants since it is a proven safe, strong and fast offshore sailboat. Our one niggling concern was the master cabin which is located in the Quarter berth; "coffin-like" seems the best way to describe it. The person on the port side cannot sit up in bed to read and we would have had to invent some interesting new positions if we were to continue to pursue a family. When we stepped into the Master Cabin on Rosie, Kelly and I instantly said this is the boat! The bed itself is queen sized at the head and still reasonably spacious at the feet. The mattress is a normal fully sprung bed mattress, just made to the unusual shape. 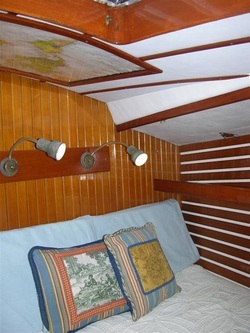 This cabin may be located forward in the boat but it would be misleading to call it a V-Berth. The bed is to port with an aisle all the way down the stbd side and lockers to the stbd of that. This room is still in the wide part of the boat due to a chain locker and a large sail locker located forward of here. Above the bed on the ceiling is a framed chart of the world. Kelly and I have spent many nights with a pointer planning and scheming our route round the world. Storage under the bed consists of two massive compartments which you reach by pulling up the mattress and two large drawers accessible from the aisle. As with all drawers on the boat we utilize the space below and behind. In this case we can get literally hundreds of cans of food below the drawers and after a little wood work we have storage for 5 cases of beer behind the drawers also accessible from under the mattress. We used one drawer each for our clothes. The forward bin for food and the port bin for miscellaneous items, out of season clothes, our Christmas tree and ornaments etc. Along the port side of the bed is a full length book shelf. At the foot of the bed is a fan and behind our heads when sitting in bed are two reading lights. There is a second fan on the stbd side along with another light. This cabin has two sets of AC outlets. At the end of the aisle, between the bed and the lockers on stbd, is a bench seat. It is in here that we store our wine. We had every bottle in its own sock, this stopped the rattling of the glass and would also help contain the problem if we had a breakage (which we never did). The socks were black for red wine, white for white wine and grey for unusual/special/champagne wines. This locker holds around 4 cases of wine - going from memory. I am sorry to say this locker will be empty when we leave the boat - it only has one bottle remaining in it anyway and that is earmarked for my birthday 3 days before landfall. The stbd side of the aisle has a full length sideboard with lockers above and below. The lockers below (we used for our shoes) have removable floors with even more storage below them. The top cabinets have two shelves inside, we used one each for our clothes. Further forward, built into the counter top is more storage, we used this as our dirty clothes hamper. Above this are two more book shelves and a shelf for a TV. Unfortunately this broke on our travels and we never replaced it. Above the bed is a big hatch that comes complete with fly screen protection. Located in the sail locker forward is a big wind scoop that attaches around this hatch and to a halyard to direct air down below on those sweltering tropical days. Below the cabin sole are two through hulls. One feeds the fridge and salt water washdown. The second via a 4 outlet manifold, the water maker and the head leaving two spare outlets. Also down here is where I store all my spare hose on the boat of various lengths and a multitude of sizes.